I am really excited about next week. I will be attending my first SUSECON and it’s in one of my favorite places, Nashville Tennessee. If you haven’t registered yet you still have time. Come join us so you can lead your company into a digital transformation by learning how to utilize open source solutions that meet your business needs. There will be over 150 sessions to choose from, lots of hands-on training, demos led by our experts, and you can even earn complimentary SUSE certifications. For me personally, it’s all about software-defined storage and specifically SUSE Enterprise Storage. We will have a kiosk in the Technology Showcase demonstrating the latest features of SUSE Enterprise Storage. There are several sessions dedicated to SUSE Enterprise Storage and you can even listen to Sanjeet Singh and Me deliver a session on SUSE Storage Solutions (Session ID: BOV1443). 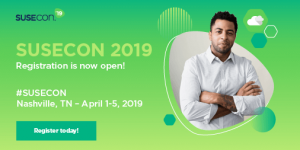 There is a lot more so I highly recommend that you click here to learn more about SUSECON, get registered, and get ready for a great week with SUSE, the open, open source company. I hope to see you there.